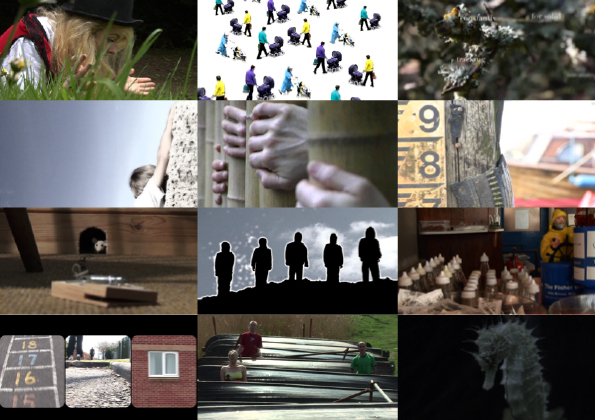 A selection of video works made by young artists and filmmakers working at the studio or as participants on workshop events in schools and youth centres. Featuring ‘Hanging Boy’ (2009) winner of 2 Best Film awards and ‘Cheeze Trap’ (2010) winner of Best Film award, Kids for Kids UK, as well as ‘Night and Day’ nominated for a Film Nation award (2012) and two newly completed ‘make a film in a day’ works, made with pupils during their schools activity week. A selection of video works made by local / national / international artists working in the studio or during location based residencies, developing collaborative works with performance artists, dancers and the local community, including ‘Hypnomart’ by Joe Magee and Alistair Gentry, first screened by Channel 4 in 2001 and a finalist for a British Animation Award, plus two installation works, ‘treetime’ by Michael Pinksky and ‘qua[d]rille’ by David Rogers (2000) a ‘Year of the Artist’ Project. Including ‘Bridport by Night’ and ‘Dorset by Night’ two new films made independently of the studio by Stephen Banks. We are also screening a selection of video works made by local / national / international artists working with the ‘landscape’, drawn from works produced during residencies or commissioned by arts festivals and individual artists responses to Dorset, featuring ‘Into the Deep’, shortlisted for a National Young Filmmaker award – Leeds Young People’s Film Festival. West Bay screenings supported by Groves Nurseries. This entry was posted in partnerships, visual, working with young people. Bookmark the permalink.